Those of you who follow me on Twitter, may have seen that I'll be off on holiday to Bali & Bangkok for two weeks! Even though there will be internet where I'm staying, I don't exactly relish the idea of blogging about the Tube while I'm lying on a sun lounger. It'd hardly be authentic too! However, rather than leaving a gap, I've lined up a great guest blogger for you. Many of you might know IanVisits and in fact he's kindly agreed to step in for me before when I've been on holiday. Ian's a perfect choice to "babysit" the blog, as he knows more about the London Underground than I do. He's been commenting & sending me stuff to blog for many years now. As well as blogging himself, he runs a ridiculously comprehensive events calendar packed with interesting things to do in London (no idea how he finds out about good events so quickly!). He's blogged and photographed some wonderful Tube related tours - including West Ashfield, Brunel's Thames Tunnel walk and a visit to the disused platforms at Charing Cross on 1938 Tube stock. 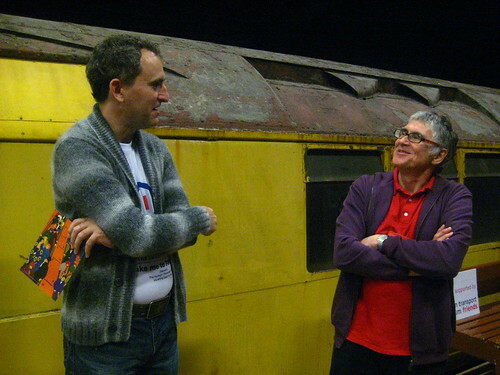 I first met Ian at launch of London Transport Museum's Art of the Poster exhibition four years ago. I'll still be popping in from time to time and if you want see what I'm up to in Bali, I'll be tweeting and adding photos to my Flickr stream. In the meantime please welcome Ian (he's IanVisits on Twitter) and I'll be back in two weeks. I always thought that London Underground mice were harmless. It appears that's wrong. 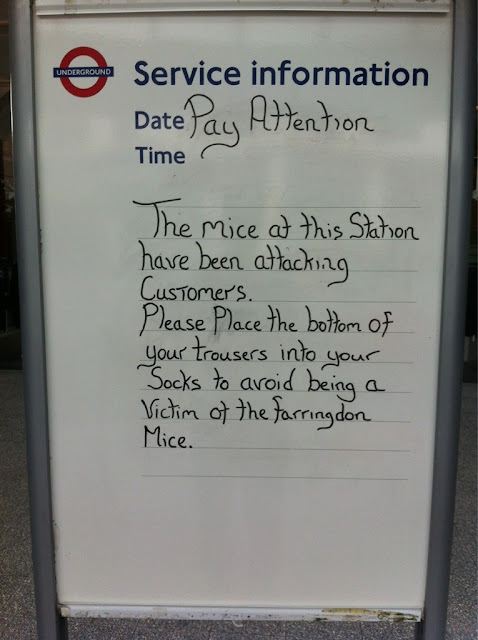 Staff at Farringdon Tube have a sign at the station entrance warning travellers to tuck their trousers into their socks to avoid being attacked by vermin there. Thanks to both @parksidemalvern & @magslhalliday for telling me about this. ITV also sent along someone to the station to film the sign, although appear not to have spoken to anyone about it while there. Not sure what you're supposed to do if you're wearing a skirt or shorts! Keep a look out for the little creatures and make a run for it. Update: Good news (or bad news - if you like the thought of dangerous mice) I've just received the following from TfL "Please note. The writing on this whiteboard was not an official TfL message and has since been removed. We are not aware of any problems with mice so do not believe this was written by station staff." Those who remember my post about the London Underground Tube Tent, may like to see that the Northern Line tent has been touring around the country. Naturally it used the London Underground itself for part of the journey. OK it didn't! Those of you who know your Tube stations very well may detect that this was shot on the disused section of the Jubilee Line at Charing Cross, where a number of ads & publicity pictures are filmed. However, The Monster Factory, the tent's manufacturers, have been taking the Tube tent on tour. It's been at V with One Direction, with Butlers in the Buff in Bristol and in a forest in China. 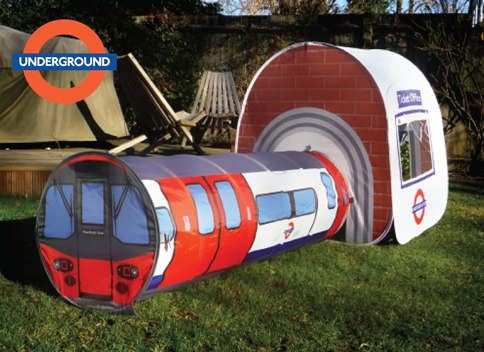 The kid's Tube tent also comes complete with its very own ticket office and tunnel. Adults might just be able to crouch into it as the ticket office section is 100cm high. Although fitting into the train would be more of a challenge as that's only 46cm high and best left to the kids! If you feel that Green Park and Oxford Circus London Underground stations are cooler than past summers, it's because they are both benefitting from new borehole air conditioning units. Take a look just to left of the station entrance in the grass in the photo above and you'll see the circular plant room at Green Park. The cooling is provided by groundwater drawn up from 80m-deep boreholes in the park. Morgan Sindall carried out the Green Park project, which also involved installation of eight air-handling units (AHUs as they are known in the trade) on the platforms. Here comes the science bit from Engineering and Technology Magazine "These are fed by cool water abstracted from two of the newly-drilled boreholes and piped to the station. The warmer return water is put back into the aquifer through two more boreholes at some distance from the abstraction points." This was the first installation of this type on the London, although at Victoria there are two platforms are cooled by groundwater that would in any case have to be pumped out of the station. 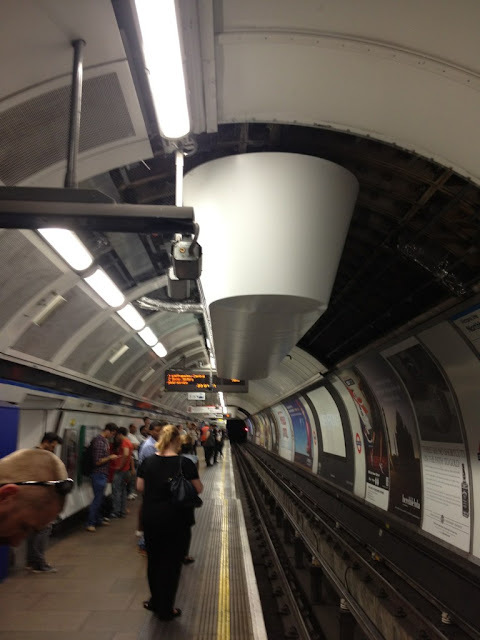 @IanDeeley noticed some huge air conditoning units had recently been installed at Victoria Line platforms at Oxford Circus. There are already air-cooling units in the ticket hall there and Birse Metro expanded the scheme with 14 AHUs in the platform areas. Air-cooled water chillers are in the roof of a building next door. London Underground has introduced air-conditioned Tube trains on its shallower sub-surface lines, but has always found it a challenge to cool the deep-level Tubes, which do not have much clearance between tunnel and the train. The lack of space for air conditioning equipment inside or outside the trains, and for heat to escape is a long term problem for the system. Back in 2003 when Ken Livingstone was mayor, he ran a competition with a £100,000 reward for anyone who could successfully cool the London Underground. At the time the reward went unclaimed, I wonder if anything like borehole air con had been suggested? As many of the know, the London Underground will be 150 years old next year. Both TfL and London Transport Museum will be running a number of activities to celebrate, including running a steam locomotive on the Tube system. Penguin Books are also releasing an interesting series of short paperbacks devoted to individual Tube lines. One of my favourite authors, John Lanchester, has written What We Talk About When We Talk About The Tube. It offers his take on the District Line. Broadcaster & journalist Paul Morley will tackle the Bakerloo line with Earthbound. Each of the £5 line paperbacks will be published by Penguin Books next March. 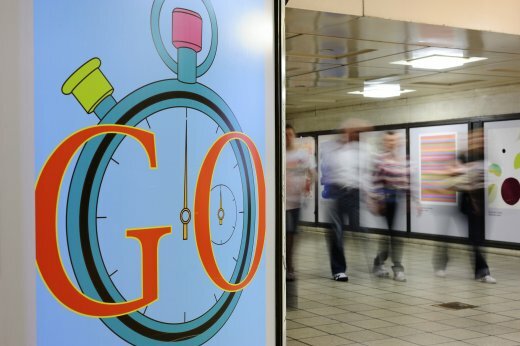 Other books by Penguin for the 150th anniversary include a definitive history of the system, a book of poems and philosophical works taking the concept of transit as their starting point and Mark Ovenden is writing a book dedicated to the London Underground's iconic design from its maps to its posters. Mike Brown, LU's managing director said: "We are really excited to be working with Penguin Books for this important anniversary, especially as it was a trip by rail that inspired the creation of Penguin Books and [because] both organisations share a history of using the same graphic designers." I was lucky enough to attend the launch of London Underground map expert, Max Roberts' new labour of love Underground Maps Unravelled, a few weeks ago. Max describes the book as an "in-depth analysis of how schematic maps assist the user, when they fail, and the psychological theories that explain why. It asks whether traditional design techniques are suited to today’s complex networks, and explores what happens when the rules are broken. The result is an astonishing collection of maps for cities worldwide that challenge preconceptions about the nature of effective design." Watch this space for my review of his book soon. 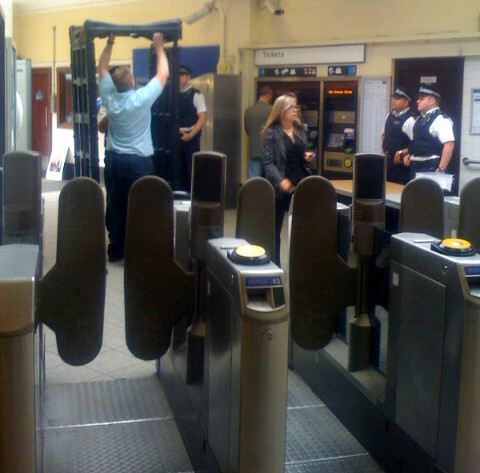 The Guardian reported that new consideration is to be given to the introduction of airport-style mass security screening at mainline rail stations and across the London Underground. You may remember that a few years ago plans to install airport-style x-ray machines in every Tube and mainline rail stations across the UK were ruled out. Not surprisingly this was because passengers might find the delays caused by this a tad inconvenient and it would lead to "passenger rebellion". 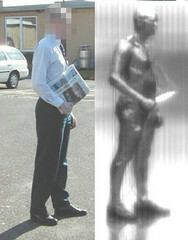 A six month trial at five unspecified locations in 2008 found that airport-style checks would be impractical and antagonise the public. Even back in 2005 in the immediate aftermath of the summer bombings of our transport system a Transport for London spokesperson said "Body scanners are completely impractical on the London Underground. Heathrow handles 67.1 million passengers each year - London Underground carries 976 million. However, the Home Office has now launched a search for new and emerging technologies that are capable of "rapidly screening huge numbers of passengers and which could be used in major train and tube stations and across the tube network". 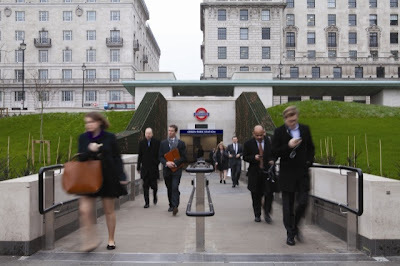 The brief for the rail and Tube screening technology is looking for something to detect explosives, guns and knives, being carried by people and in bags, but "would also need a capacity to spot chemical and biological materials. The screening equipment needs to be able to scan wheelchairs, prosthetics, crutches, pushchairs and bikes as well as people and their luggage". It says that while the stations can be defined as "crowded places", there are locations where crowd movement is "semi-controlled", such as at ticket barriers, queues, at the top and bottom of escalators and at platforms, which could prove suitable screening points. The equipment may be fixed and built into the station furniture, or portable, to be used in different areas depending on passenger flow, threat level or intelligence." There are a number of stations on the Tube network that have knife arch scanners and it will be interesting to see how & whether technologyhas moved on from 2005 and 2008 when these ideas were last mooted. At the moment the hunt for the technology is "academic" and will start next month, with results due in March 2013. 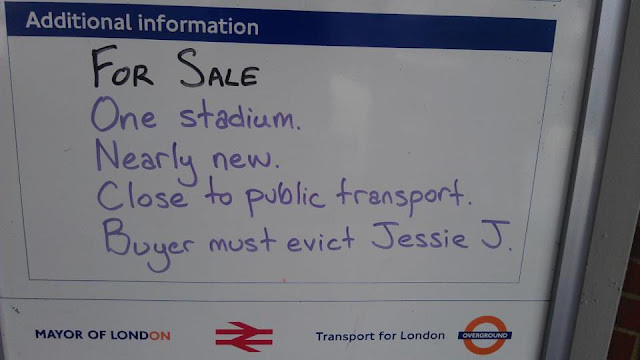 While much of London is still suffering from "NOlympics" depression, some bright spark at a London Overground station has some fun with the white boards. Those of you who watched the Olympic closing ceremony with have a certain amount of sympathy for the last line. Not sure where this was taken, it looks a bit like the handiwork of Shoreditch High Street Station to me, However, other internet comments suggest it was at Hackney Wick. If you know, let us know! Rather than rush through Piccadilly Circus London Underground station you might want to spend a few minutes looking at a new display of posters there. Art on the Underground have commissioned images by twelve of the UK’s leading artists to celebrate the London 2012 Olympic and Paralympic Games. Apparently since 1912 each Olympic host city has commissioned posters to celebrate hosting the Games and since the first Paralympic games were held at Stoke Mandeville, posters have also been commissioned for the Paralympic games. Art of the Underground said "These official posters are now themselves a special celebration of the meeting of art and sport over the last 100 years. The London Organising Committee of the Olympic and Paralympic Games (LOCOG) has commissioned twelve of the UK’s leading artists to create images to celebrate London hosting the 2012 Games, six for the Olympic Games and six for the Paralympic Games." "The artists were encouraged to celebrate the Games coming to London and to look at the values of the Olympic and Paralympic games. Each image is a distinct interpretation of either the Olympic or Paralympic Games by the individual artists and the diversity of the series demonstrates the extraordinary creative talent that exists within the UK". 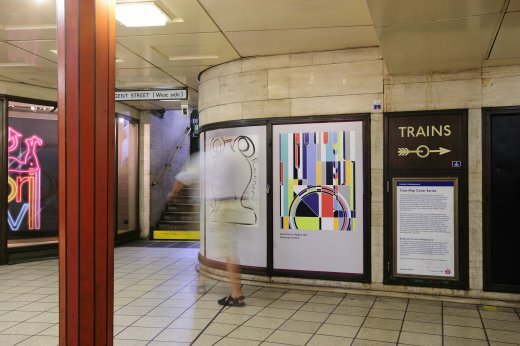 The posters are from artists Martin Creed, Tracey Emin, (who is also penned the artwork for the current Tube map covers), Gary Hume, Sarah Morris, Bob and Roberta Smith, Anthea Hamilton, Howard Hodgkin, Chris Ofili, Bridget Riley, Rachel Whiteread, Fiona Banner and Michael Craig-Martin. The images are also on display at Tate Britain during the summer as part of the London 2012 Festival and are available to buy as posters or limited edition prints. 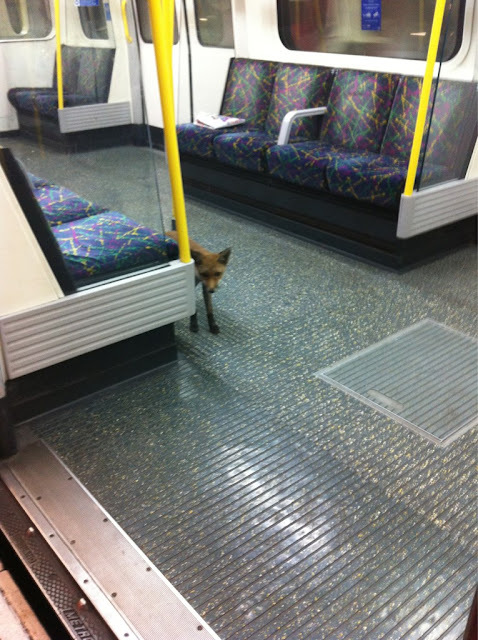 There's been some wildlife spotted on the Tube, rats & mice on the tracks & the odd pigeon in carriages, but rarely are foxes seen on the London Underground. 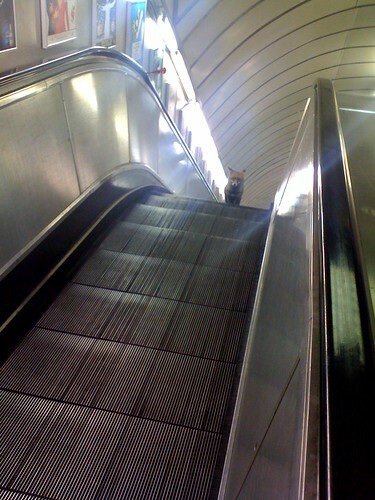 @Stephen_ebert saw this bold creature on his Tube journey last night. @Harrie_Horn also spotted one, although her shot is blurrier and her camera makes it look as though it has demonic eyes! The little blighters are clearly getting even more confident and are travelling in carriages now! Has anyone seen ads for err... "brands" of trains before? I think this is the first ad I've seen on the London Underground for a train manufacturer. Bombardier are clearly so proud of their new "fast, efficient & eco friendly trains" that they're running advertisements for them on the system. 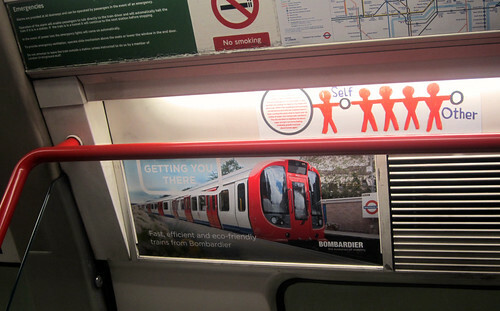 Perhaps a condition of getting the contract from TfL to supply the S Stock trains was to run ads putting across Bombardier's by-line of "the evolution of mobility". Although it's not as if we have a choice of which trains we take when we're on the London Underground. But, maybe I'm wrong. Perhaps there are some people who wait around at platforms until a shiny new train comes along. If you've a bit of time to spare maybe it is worth getting on a nice air conditioned eco friendly train! 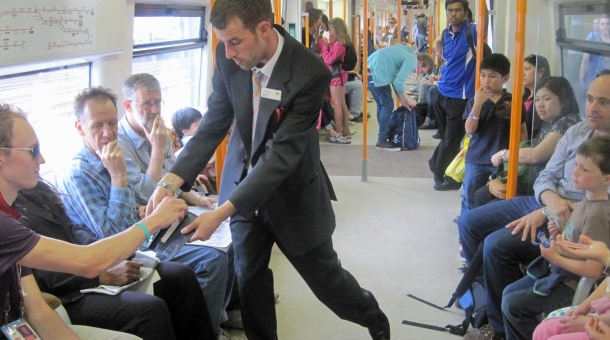 If you see a suited person with TfL badge on your London Overground asking for your card, the chances are it's not your Oyster Card he's interested in. 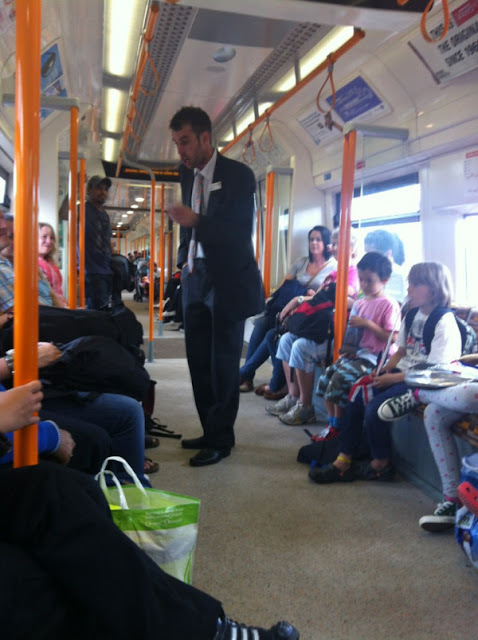 Magician Danny Hall performing with Stage Up has been taken on to entertain passengers throughout the London Olympic Games. Up until August 11th 2012 he'll be on carriages and at at stations on the east end of the North London Line – Hackney Central, Homerton and Hackney Wick. The Stage Up acts feature local, up-and-coming performers, who will play 30-minute acoustic slots on small areas of the platforms. 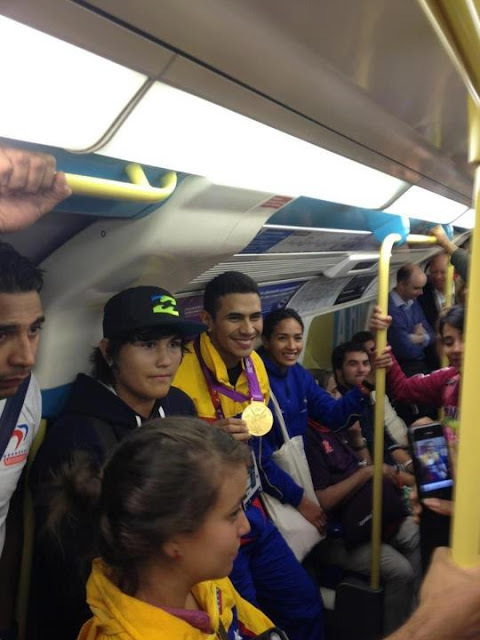 We're coming to the end of the first week of the Olympics & finally the Tube picture many of us have been waiting for. Forget shots of overcrowded Tubes (although as yet it hasn't been worse than normal). 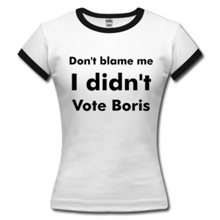 Forget shots of tourists looking confused & herding round interchanges. Forget the shot of the Olympic torch being carried on the front of Tube train (although no one seemed to get that anyway). It's the shot of an athlete carrying a Gold Medal on the London Undeground. It's actually great to see athletes using the Tube in the first place, but to see one proudly posing with their medal was a delight. I'm not sure who originally took this photo of Venezuelan fencing champion, Ruben Limardo but comedian Omid Djalili Tweeted it yesterday afternoon & it went around Twittersphere like wildfire.